The restrained uniformity of its elegant residential boulevards punctuated by immense palaces, soaring churches, and flamboyant public buildings, can make Paris initially feel coolly intimidating to the visitor. Yet behind the pale limestone walls and beaux arts edifices, untold riches abound. Color, texture and dynamism reward both those who trod the well-worn tourist paths as well intrepid souls who scratch below the surface seeking out its hidden gems. To follow are some of the highlights of our recent trip there. Arriving in the morning, we immediately checked in to the Hotel Lancaster. A stone’s throw from the Champs Elysees it had a nice blend of formality and charm. Our room on the first floor overlooking the courtyard provided the added bonus of not having to wait for the elevator (which has always been an issue for me). After freshening up we walked down the Champs Elysee and through the Tuileries gardens to immerse ourselves in Monet’s Waterlilies at the Jeu de Paume. On the way, we passed a plaque marking the site of the first Hot air balloon launch. Always on the lookout for things that have connections back home, it reminded me of a rare clock at on a mantle at Clermont State Historic Site, commemorating the same event. We crossed over the Pont des Arts to poke around St Germain de Pres afterward.I was happy to see that despite the cities constant removal of them, there were still plenty of love locks to be found along its railings. We stopped in Deyrolle, at 46 Rue du Bac. The famed taxidermy shop operation, founded in 1831, was everything I imagined it would be. I was even able to take this photo downstairs in the gardening section, before discovering that no photography was allowed inside. If we weren’t at the very beginning of the trip, I had bigger luggage or the money to ship one of the specimins, one of the creatures in the main showroom upstairs would have found its way home by now! That evening we went to see the "Christian Dior, Couturier du Reve"Exhibition at the Musee des Arts Decoratifs. Arriving an hour before closing time, the woman who sold us our tickets tried her best to gently dissuade us, saying there might not enough time. After going through the first two rooms, we understood - one could lose themselves for a full day at this show. Afterwards we dinner at the museum’s café located in the courtyard of the Louvre. It was quite a Parisian scene and almost perfect (points taken off for the 45 minutes that elapsed between giving us dessert menus and asking if we wanted anything). We made our way back to the hotel through a carnival midway set up in the Tuileries for summer. The next morning we went to the Rodin Show at the Grand Palais. Marking the centenary of his death, it integrated the evolution of his style, the peak period of his fame, and his pervasive lasting influence on subsequent generations of artists in a very dynamic way. Aside from the lasting impression of the show, it was also my first time inside the Grand Palais. A wonder of beaux-arts architecture built for l’Exposition Universsalle in 1900, it is befitting of its name in every way. Afterwards we visited the Petit Palais, directly across the street from the Grand Palais (and only petit in comparison to what it faces). Holding the Museum City of Paris fine arts collection, I had never been before (and it was free to boot). A stroll across the Pont Alexander and across the grounds of les Invalides found us in the environs of the Musée Rodin. Any hesitation I had about it feeling redundant after visiting the big Rodin Show proved to be unfounded. The exhibits were different enough to perfectly compliment those at the Grand Palais. In addition the visitor has the added benefit of being able to wander through the rooms and garden of the Hotel Biron, one of the city’s finest 18th-century hotel particuliers, in my opinion. 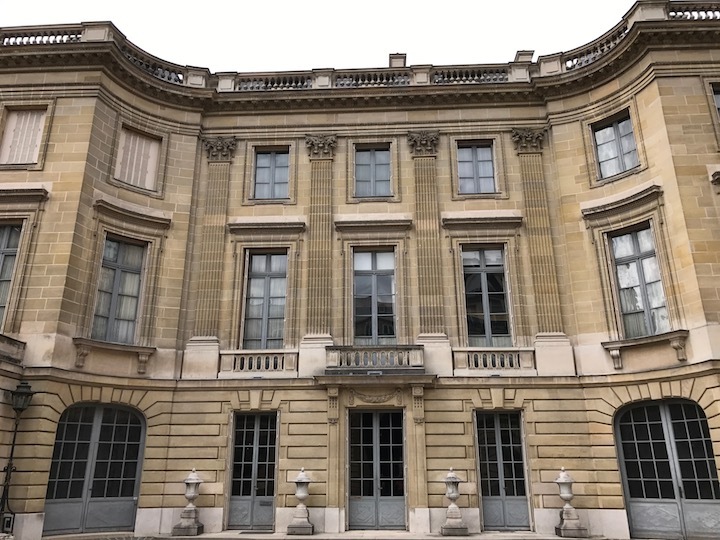 From the 18th Century we next moved up to one of the city’s great 20th century mansions, the Musee de Nissim Camondo. Built in 1911 for the Comte Moise de Camondo in the 8th arrondisement next to the Parc Monceau, it houses his superlative collection of 18th century French decorative arts. The museum is preserved as close to its state as when he lived there, offering a bit of time capsule feeling as well. Brendan had a hankering for Steak Frites that night, so we headed over to Relais del’Entrecote. It serves one dish and one dish only on its menu, steak frites with bernaise sauce. They don’t take reservations, the line was long, and it was rather touristy – but totally worth it. We walked back towards the hotel along Avenue Montagne after dinner and slept well that night, ready for our next day at Versailles.